Failing to plan for the future can lead to unnecessary stress for seniors, as well as unwanted expenses. A financial plan can be critical to an aging adult’s overall health, regardless of his or her available income. 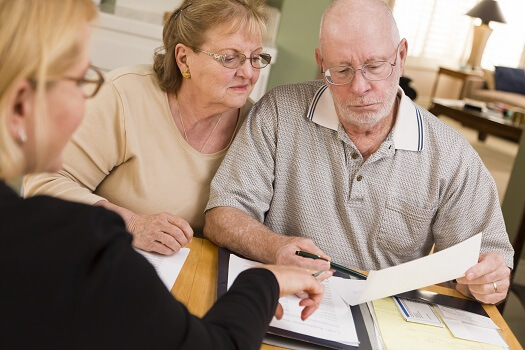 Here are some financial planning strategies for seniors and tips family caregivers can use to help their aging loved one achieve each goal. The most important step is to build a schedule that includes your loved one’s monthly income against his or her monthly expenses. Determine which expenses can be reduced or cut entirely. Having a budget may give your loved one an idea of what he or she can spend on nonessentials. An ideal budget can help seniors enjoy their golden years without compromising on their quality of life. If you have a senior loved one who needs help maintaining a high quality of life while aging in place, reach out to Home Care Assistance, a leading provider of elder care Oshkosh families can rely on. All of our caregivers are bonded, licensed, and insured, there are no hidden fees, and we never ask our clients to sign long-term contracts. When debt isn’t paid off, it continues to increase over time. Making strategic payments can help aging adults pay their debt off sooner, relieving stress and anxiety encountered due to creditors. Instead of paying the minimum payment, encourage your loved one to overpay so he or she can lower the monthly payments and get closer to the payoff date. When debts are paid off, your loved one will have more money added to the monthly budget. With aging comes a higher risk of various health conditions, including heart disease, memory loss, and arthritis. Treatment for these conditions can be expensive, which is why seniors need to have a good insurance policy in place. Your loved one should speak with his or her provider to determine what is covered under the policy and which expenses need to be paid out of pocket. The biggest mistake many seniors make is underestimating their long-term care needs. You never know when an emergency will occur, which is why your loved one should have funds allocated for such situations. Each pay period, your loved one should set aside money in a savings account and only withdraw funds when there’s an emergency. If this financial planning strategy is executed correctly, your loved one could save enough money to cover at least six months of living expenses. Aging adults face various challenges, but by building an emergency fund they can overcome financial difficulties. Certain age-related conditions can make it more challenging for seniors to age in place safely and comfortably, but Oshkosh live-in care experts are available around the clock to help seniors manage their health. Whether your loved one is living with dementia or is recovering from a stroke, you can trust the professional live-in caregivers from Home Care Assistance to enhance his or her quality of life. Even if your loved one has the money to cover transportation, food, and medical expenses, he or she shouldn’t rule out using local resources. If there’s a program in place for older adults, your loved one should consider looking into it. Utilizing available resources can help seniors stretch their income and use the savings in emergency situations or expenses not covered in their monthly budget. Seniors are targeted at a higher rate by scammers compared to other age groups. Monitoring their credit on a regular basis can prevent identity theft. Any cases of insurance fraud, stolen funds from a bank account, or unauthorized credit card charges can be found out by monitoring your parent’s credit report and financial accounts on a regular basis. Financial planning is just one of the many ways you can help your parent age gracefully. Living independently is important for seniors who want to maintain a high quality of life. For some, this simply means receiving help with tasks that have become more challenging to manage over time. Even when families have the best intentions, they may not have the time to provide the care their elderly loved ones need and deserve. If your loved one needs help for a few hours a day or a few days a week, reach out to Home Care Assistance, a trusted provider of respite care Oshkosh seniors can depend on. Call (920) 710-2273 to speak with a Care Manager today to find out how your aging parent can benefit from in-home care services.